Animal silicone moulds for creating cute animals in chocolate or sugar paste, such as dogs, cats or rabbits to be realized for your customers. Beautiful animals representing every part of the world, from the savannah to the deepest depths of the sea with decosil animals you can decorate the showcases in a fun and unique way! 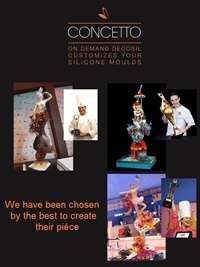 decosil proposes 3D chocolate animal moulds made with silicone.